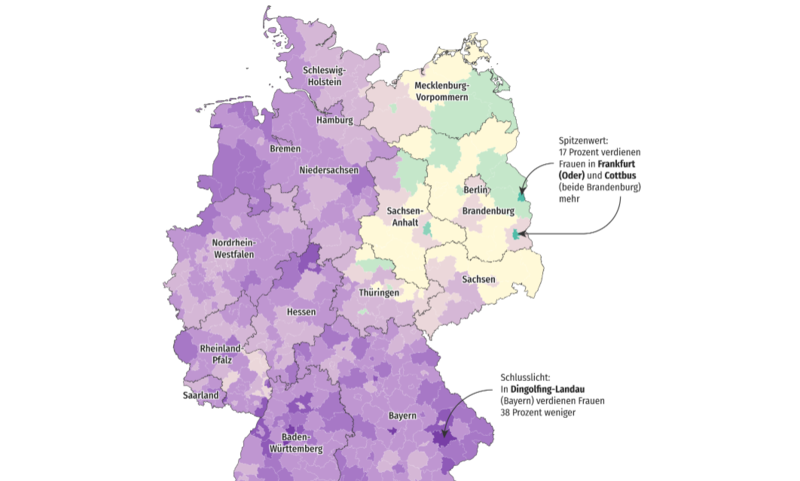 An interactive map reflecting data on Germany's gender pay gap, by the data team at Berliner Morgenpost. For my research on data journalism in small newsrooms, I talked to heads of data teams in Germany, Austria and the UK. I found that size is no barrier to innovation. Data journalism is all about team work, and smaller newsrooms can be at an advantage when it comes to integrating data teams. The small, traditional newsroom Berliner Morgenpost had an almost fairytale-like success story with its efforts in incorporating data journalism. "At first, colleagues with traditional newspaper background were surprised, as Julius Tröger recalls: “They were like ‘Oh, online journalism is more than copy and pasting?’"
Julius Tröger started working for Berliner Morgenpost’s online team in 2010. It’s a small team of just eight reporters, and the entire newsroom of this local newspaper in Berlin comprises less than 100 reporters and editors. At the same time, Tröger started studying computer science. In 2011, he did his first data journalism story on the parliamentary elections in Berlin. With the help of another journalist, he programmed an interactive map where users could select the results of their own polling station. One year later, Tröger went to the U.S. and interned at The Guardian’s and ProPublica’s data teams. When he returned to Berliner Morgenpost, his editor-in-chief realized how useful his new skills were and reimbursed Tröger for his travel expenses. He began concentrating solely on data journalism, and said to his editor-in-chief: “I can do a little bit of programming, but I need a programmer.” He got one, and began to create Morgenpost’s data team in earnest. Some of the more senior reporters and editors began showing interest in collaborating with the data team, and became co-editors of data-driven stories. “Today, we are totally integrated” into the newsroom, “but during the first couple of years, we were a foreign body,” Tröger says. All of this took place within just a few years. So how did they do it? And do small newsrooms like the Morgenpost have an advantage in creating data journalism teams? 2) Easier to collaborate and experiment. Small newsrooms are a better playground for experiments: Reporters often need to take initiative and show results before leaders take notice. Julius Tröger left his comfort zone of copy-and-paste online journalism and made an effort to learn more about data. It was only once he started doing his first data stories and won awards that his editorial board got interested. Megan Lucero is the head of the UK-based Bureau of Investigative Journalism’s Bureau Local, which was founded last year. The Bureau Local helps local newspapers build expertise in data journalism. “It is much easier for smaller newsrooms to change and introduce new things,” Lucero says. “It is great to be a smaller organization, because you can pair up with academics and researchers.” Lots of communication around work flow and deadlines is the key to success, according Lucero. Even without the support of a network like Bureau Local, the data journalism community is usually very helpful and responsive. Many of my interviewees stated that if they get stuck with a data project, they would seek out and offer help to one another – even beyond company borders. “Coopetition,” collaboration between competitors, is common practice. 3) Change can happen faster. Data start-ups like Bureau Local have another big advantage: They don’t have a “long-grown resistance against data,” as Peter Sim, a data journalist from Austrian investigative non-profit Dossier, told me. Today, Berliner Morgenpost’s interactive team consist of five full-time journalists and two part-time developers. Other newsrooms send their journalists to intern at the Morgenpost to learn and start their own data units. Since January 2017, the data team has developed data-driven stories for the Funke Gruppe, and their stories have been adapted for local outlets like Hamburger Abendblatt. Berliner Morgenpost’s interactive team has received 50 journalism awards. Bettina Figl is a reporter for the daily national Wiener Zeitung in Vienna, Austria. She specializes in longform, features and digital journalism while covering stories about education, politics, social issues, and feminism. In fall 2017, Bettina Figl was a journalism fellow at University of Oxford, where she did research on data journalism in small newsrooms at the Reuters Institute for the Study of Journalism.